A SINGLE PACKET of Dulcey Blonde (think sophisticated Caramac!) mini trees mixed with unicorn confetti – we think these make perfect stocking fillers! 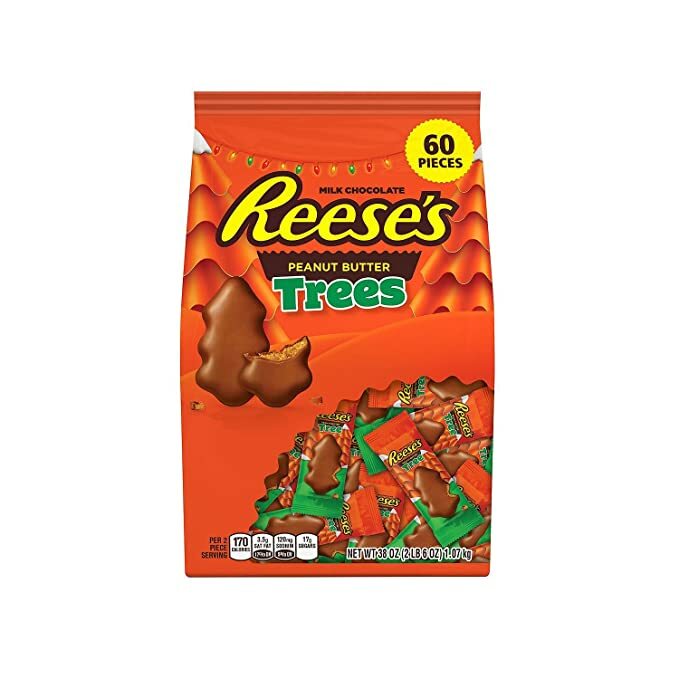 Approximate weight – 30g per pack. Please note that as our chocolates are handmade, weights can vary a little. 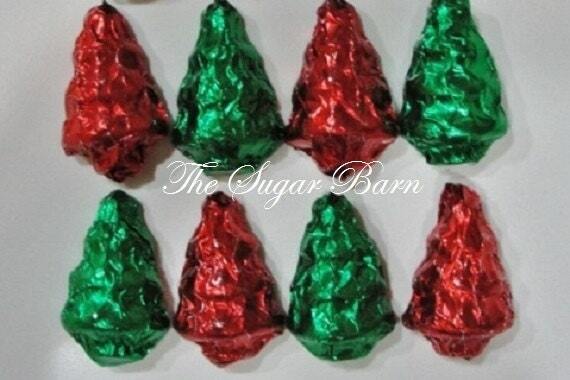 Each order comes with a dozen (12) Mini Chocolate Christmas Trees, freshly made when you order! Treats come individually wrapped in plastic wrap. 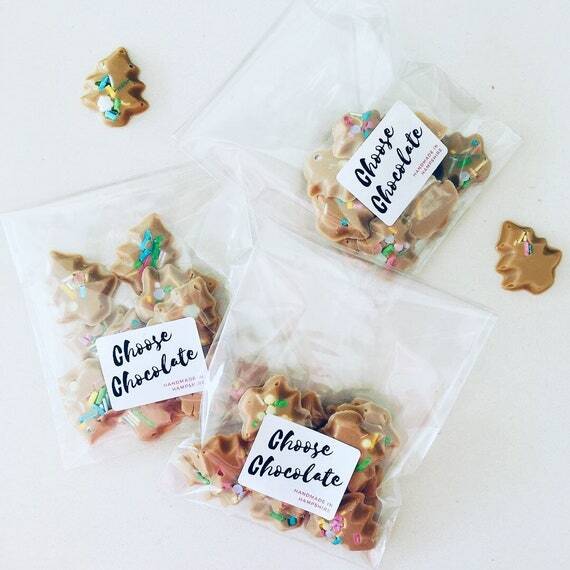 If you would like to add bows to your treats please select bows when purchasing your order. Please also let me know what color in the “Note to Seller” Box when checking out. Happy Holidays! 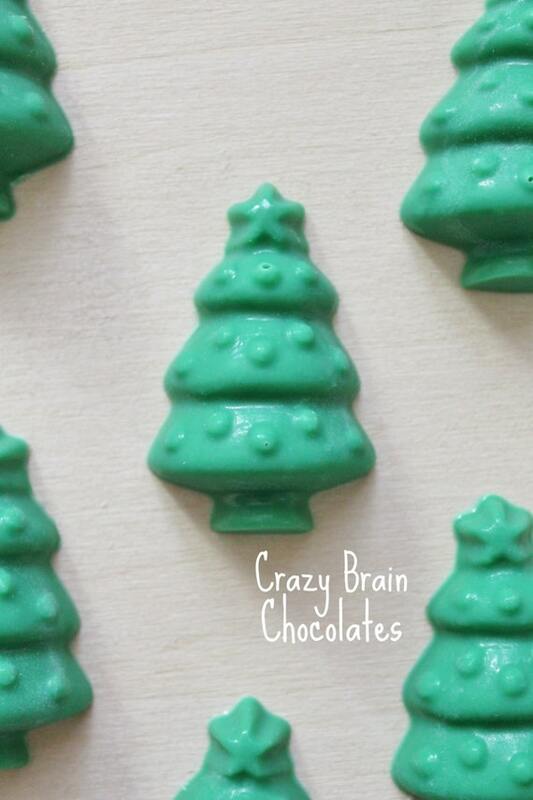 These MINI CHRISTMAS TREE SOLID CHOCOLATES will look great atop your holiday cupcakes. They can be wrapped in holiday foils and used for stocking stuffers, teacher gifts, or Secret Santa gifts. Some other ideas….set one at each place setting for your holiday dinner or use as a surprise in your Advent Calendar Pockets (Countdown to Christmas). Picture #3 shows (left to right): Sugar Cookie (no longer available), White, Candy Cane. Foil wrapped trees will be wrapped in various colored foils. 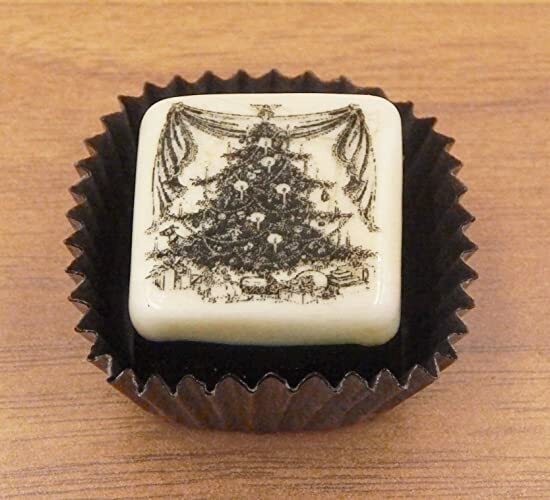 A handmade collectible solid glass chocolate topped with a layer of vanilla and a beautiful decorated Christmas tree. This glass chocolate is created from colorful glass utilizing flameworking techniques. Meticulous attention to detail has gone into the construction of each of our pieces to enhance its appeal and collectibility. This inedible chocolate is from our ‘Holiday Collection’ and is just one of our many chocolate treats. We design our art glass delicacies to evoke memories of innocence, love and happy times. These pieces are created to tease, seduce, tempt and delight. Use them to create a unique display in a favorite heirloom dish or cabinet for your home or office. They are also perfect and thoughtful gifts for yourself or your friends. The glass chocolate measures approx. 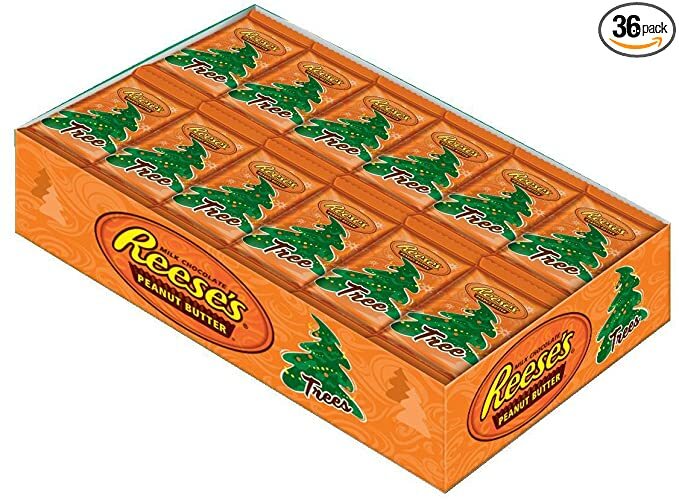 1.25″ x 1.25″ (slightly larger than an actual chocolate candy) and sits in a brown fluted glassine paper candy cup. The bottom of the chocolate is covered in felt to protect the surface it will sit upon. Each beautiful glass chocolate is signed (Hulet) , dated and comes to you in a colorful gift box with an enclosure card telling a bit about the piece.